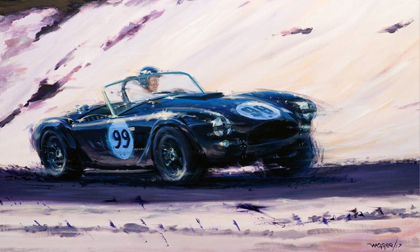 CARMEL, Calif. – July 27, 2017 – Klaus Wagger, a member of the Automotive Fine Arts Society (AFAS) will debut his stunning painting featuring “All American Racer” Dan Gurney piloting a Shelby Cobra, along with several other new works at the Pebble Beach Concours d’Elegance on Aug. 20, 2017, in Carmel, California. Wagger’s piece will be part of the AFAS show, which is located next to the famous Lodge at Pebble Beach. “Gurney at the Bridge” is a 55-inch by 35-inch acrylic on canvas piece that features Wagger’s signature style of abstract background and tones. Wagger’s style perfect conveys the intensity of the moment, making it seem as if the American roadster is exploding across the frame with Gurney behind the wheel. One of three factory team cars built specifically for the 24 Hours of Le Mans race, this roadster (CSX2137) was the first Cobra to win in the 1960s competition between Shelby and Ferrari. Dan Gurney drove it to victory at Bridgehampton, New York, in September 1963. It was the first FIA World Sportscar championship win for the fledgling Shelby American team and the first FIA win for an American driver in an American car. Klaus Wagger grew up in the Austrian Tirol, surrounded by a surprisingly active motorsport scene. This included F1 drivers Gerhard Berger, Karl Wendlinger and local hero Franz Albert, who always seemed to run the noisiest and most exotic cars, leaving a deep impression on the small kid. From drawing cars in his school books, he graduated with a degree in Industrial Design and began a freelance career as Designer and technical illustrator. He entered a competition to design a poster for the Mille Miglia in 2000. His spectacular study of a Mercedes SSK in flight took first prize and Wagger’s work has since been featured several times for the promotion of prestigious Italian events. It was at the Retromobile in Paris that his painting career really took off. Motoring art has always been a strong feature of this premier French show and in 2004 Wagger’s bold style and vibrant brushwork were the talk of the show. Retromobile has been the mainstay of his exhibition schedule ever since, although he has shown at the Goodwood Revival, Festival of Speed, Silverstone Classic and Techno Classica. His accomplishments include being commissioned to paint the poster art for the 2007 Daytona 500 and the 2006 calendar for the Carabinieri in Italy. The AFAS display will take place during the Pebble Beach Concours from 9:00 a.m. to 4:30 p.m., in Carmel, California. This is the 22nd year that Lincoln Motor Company will sponsor the AFAS exhibit on the Pebble Beach show field. AFAS was established in 1983 by a group of artists who are acknowledged by critics to be among the best in their field. Members work in many diverse mediums including oil, watercolors, acrylics, wood, gouache, pen & ink, clay and metal. AFAS participates in select shows across the country including the Pebble Beach Concours d´Elegance and the Amelia Island Concours d´Elegance. More information is available at www.autoartgallery.com or by contacting Scott Black at (214) 520.3430 ext. 303 or sblack@tprm.com.